This was my second time shooting one of my favourite ever bands, Interpol, and the fourth time I’ve photographed Paul Banks officially. The Dublin leg of the Marauder tour consisted of three nights in the Olympia Theatre, one of their favourites it seems. I shot the opening night for MCD and was just one of three photographers. This made for great space in the photo pit for us. On their last tour for El Pintor the band were quite darkly lit, but the backdrop of the red hands from the album cover behind them led to some shots I really liked. That time I didn’t come out with any great shots of Daniel Kessler, and pretty much none of Sam Fogarino, at the back of the stage on drums. This tour was definitely a better shoot. Opening proceedings on the three nights was Londoner Nilüfer Yanya. She was a far calmer and easier support to photograph than Health on the last tour. Interpol opened with Untitled, and this time Daniel Kessler was better lit and easier to photograph than Paul Banks through the song. I spent a good portion of this song shooting Dan and Sam. I was delighted to get good shots of Sam finally, since he was doing a DJ set on the day of their final show, and I wanted to get a shot of mine signed. I managed to get his signature on the above shot. The lights and dry ice were a mixed bag throughout the three song shoot, but there was enough time with the songs they played to capture all members of the band well. The biggest frustration were the egg shaped lights between the PA at the front of the stage. It really hindered the vantage points for wider shots. They had a disco-ball overhead (I know right? 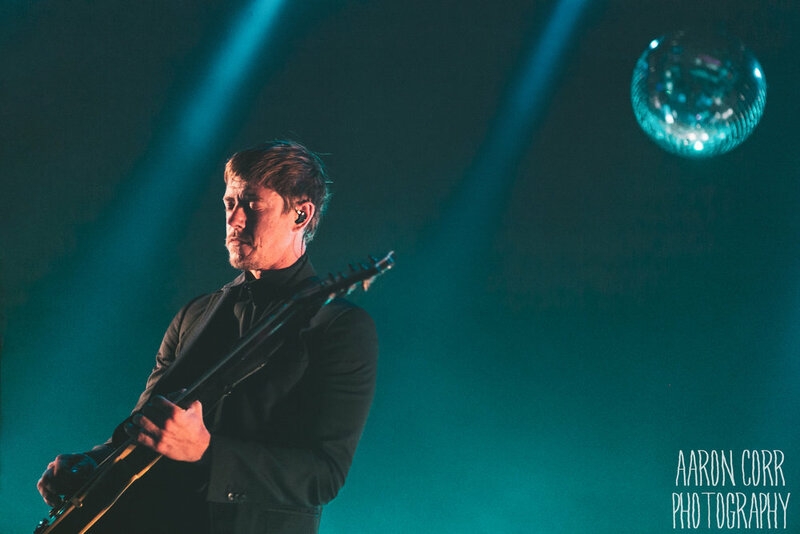 Interpol and a disco-ball) which was not used to much effect until the last few shots I took. After the three songs, certain songs in the set used it heavily, and it looked fantastic. But while it looked cool, the colours during those songs would have been a nightmare to shoot, and edit, so I’m happy with how the shoot turned out. I went to all three nights and loved every minute of it. They’re still one of the best. Click here for full gallery, and here to see the set from El Pintor tour.